Presbyopia can be corrected with multifocal corneal laser surgery in selected presbyopic hyperopic patients using customized multifocal aspheric correction. We have reported in the November 16 issue of the Journal of Refractive Surgery the clinical results of combined presbyopic hyperopic LASIK corrections obtained with a uniquely designed multifocal method aimed at reshaping the corneal profile asphericity (Q value)using the custom Q program mode of the EX500 excimer laser (1). This page will explain the theoretical basis that underpins the principles used to achieve multifocal presbyopic corneal surgery. 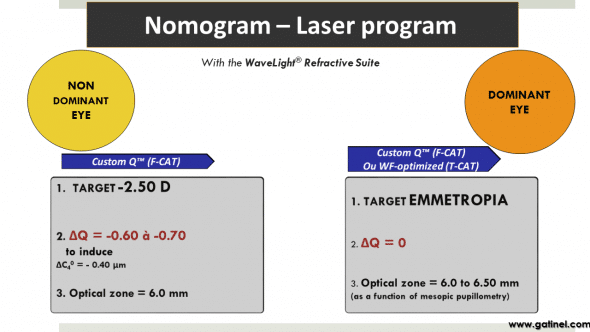 These principles can be translated into surgical planning with any laser platform that enables the targeting of a specific postoperative corneal asphericity (Q value) such as the Alcon/Wavelight refractive suite. Spherical aberration and corneal asphericity are the main variables at play in the domain of multifocality. These terms will be explained and their respective roles and mutual interplay defined. Multifocality reflects the presence of various refractive errors within the area covered by the entrance pupil. An emmetropic eye has refractive power enabling the rays emitted by a source located at infinity to be focused in the retinal plane. Myopic or hyperopic eyes exhibit an excess or a deficit in their refractive power, respectively. The process of determining the subjective refraction of the eye suggests that a non-emmetropic eye exhibits a single refractive power error which can be corrected by a sphero-cylindrical lens, for example: 2(-1 x 0°). However, with the eye being an “imperfect” biological structure, its refractive power is not actually constant throughout the entrance pupil. Subtle local refractive errors remain even after the determination of best refractive correction. Despite the addition of a sphero-cylindrical lens aimed at making the eye emmetropic, not all the rays that are refracted throughout the entrance pupil are focused in the same plane. These residual errors would not exceed +/- 0.75 D across the pupil in normal emmetropic eyes. Our visual system is “built” around these imperfections, and this tolerance to some local defocus accounts for the natural “depth of field” of the human eye. However, it is not sufficient to replace the lack of accommodation power of presbyopic eyes. Some aberrometers, such as the OPDscan III (Nidek, Japan), allow the display of these local variations of refractive errors in a vergence map called the “OPD map”. This map plots the local variations of the refractive error across the entrance pupil area of the eye of interest, that is, the local excess (myopia) or deficit (hyperopia) in optical power (or vergence) (see Figure 1). 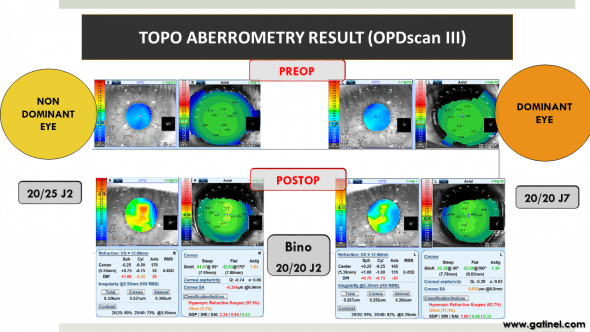 Figure 1 : Example of an OPD map obtained with the topographic aberrometer OPDscan III (Nidek) in an emmetropic eye (uncorrected distance visual acuity is: 20/15). The result is a wavefront vergence map that is similar to the refractive power maps in corneal topography but addresses the plot of the local refractive error of the whole ocular optical system (cornea + crystalline lens) within the entrance pupil disc zone. In this example, high order aberrations are responsible for little fluctuations of the refractive error around zero. Astigmatism corresponds to a meridional variation of the ocular refractive error, usually caused by corneal toricity (Figure 2). Figure 2 : Example of an OPD map obtained with the topographic aberrometer OPD scan III (Nidek) in an highly astigmatic eye (best corrected distance visual acuity: 20/20). 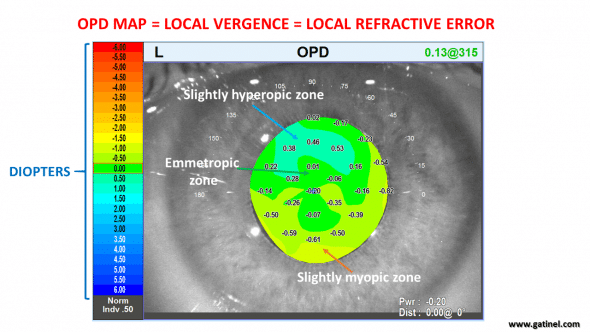 The specific effect of high order aberrations is difficult to appreciate, as the vergence map is dominated by the astigmatism-induced meridional changes in the refractive error. Instead of a wavefront map, which may not intuitively bring clinical relevance, the OPD map enables the clinician to directly estimate the impact of the low and high order aberrations on the refractive properties of the examined eye. The non-systematic local variations of the refractive error relate to the presence of “high order aberrations”. This clinician-friendly interpretation has profound impact on the understanding and planning of multifocal corrections. Spherical aberration is a type of high-order aberration which describes the presence of a concentric gradient of power between the center and the periphery of the pupil. Consequently, the larger the pupil, the larger the amount of measured spherical aberration. In most human eyes looking at infinity, the measured ocular spherical aberration is positive because, regardless of the refractive status, there is a slight increase in refractive power from the center to the edge of the pupil. An emmetropic eye generally exhibits a slight amount of myopic error toward the edges of the pupil (Figure 3). Enabling the option “High Order (HO)” on the machine allows one to visualize the sole impact on the local refractive error of these higher order aberrations, which cannot be corrected by spectacles. Figure 3 : Removing the effect of the best spherocylindrical error on the display allows one to plot the specific effects of the residual high order aberrations. There is a moderate gradient of increased myopic error towards the pupil edge, reflecting the presence of a sllght amount of positive spherical aberration. Ocular spherical aberration relates to the difference between the refractive powers of the center and the edge of the functional pupil. The larger this difference, the larger the value of the spherical aberration, regardless of the mathematical function used to quantify this aberration. Zernike polynomials represent a class of mathematical functions which can be used to model the optical aberrations of the human eye. Z40 is the symbol for spherical aberration, which is weighted by a coefficient c40, whose value is expressed in micron units and refers to a specific pupil diameter. The Zernike spherical aberration mode has some distinctive features: it contains some « defocus » (low degree) which is myopic for negative spherical aberration and hyperopic for positive spherical aberration. 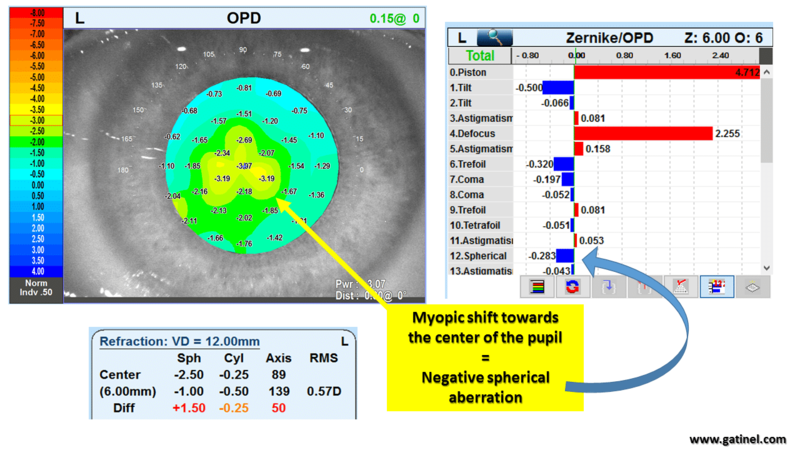 This characteristic will not be discussed here, and when mentioning Z40 we will refer to the true « higher degree » component (term in r^4, that is in the fourth power of the radial distance to the center of the pupil,which modulates significantly the refraction within the pupil toward the periphery : increased hyperopia/ decreased myopia for negative spherical aberration). When the refractive power (vergence) is higher at the pupil center than its periphery, spherical aberration is said to be negative (c40 <0). Conversely, when the refractive power is lower at the pupil center than its periphery, the spherical aberration is said to be positive (c40 >0). In terms of refractive power, spherical aberration simply characterizes the progressive variation of the refractive power from the center to the edge of the pupil, independent of the values of these powers themselves. Multifocality can be induced by increasing the amount of spherical aberration to improve the ability to form retinal images of nearer and farther image targets with reasonable sharpness. The manipulation of spherical aberration may aim at increasing the natural gradient of refractive power from the center to the periphery (ie an increase in positive spherical aberration). For combined hyperopic and presbyopic corrections, it is more common to reverse it (ie to induce negative spherical aberration). This can be achieved by inducing some myopic defocus at the center of the pupil and reducing some myopic defocus towards the pupil periphery (inducing negative spherical aberration). In what follows, we will use the terms “central pupil zone power” or “paraxial power” to refer to the average optical power (ocular vergence, expressed in diopters) within the central disc of 1.5mm radius centered on the corneal vertex. The “paracentral power” or “peripheral pupil zone power” corresponds to an outer annular concentric area surrounding the central 1.5 mm zone, which is delineated by the pupil edge. This distinction is somewhat arbitrary, as it is not possible with laser corneal surgery to induce two different refractive powers delineated by a sharp transition between these zones. Rather, the smooth character of the corneal profile results in a smooth gradient in curvature, and by consequence, a progressive variation of the refractive power from the corneal center to its periphery. However, this distinction carries some functional relevance. The sphero-cylindrical refraction giving the best corrected visual acuity is largely governed by the optical power of the central (paraxial) zone of the refracted eye. When best correction is achieved (i.e maximizing the visual acuity for distance targets), the contrast sensitivity and depth of focus depend on the differences between the respective optical power distribution between the paraxial and paracentral zones; the more consistent the refractive error throughout the pupil area, the lower the depth of focus and the higher the retinal contrast of the image, and vice versa. 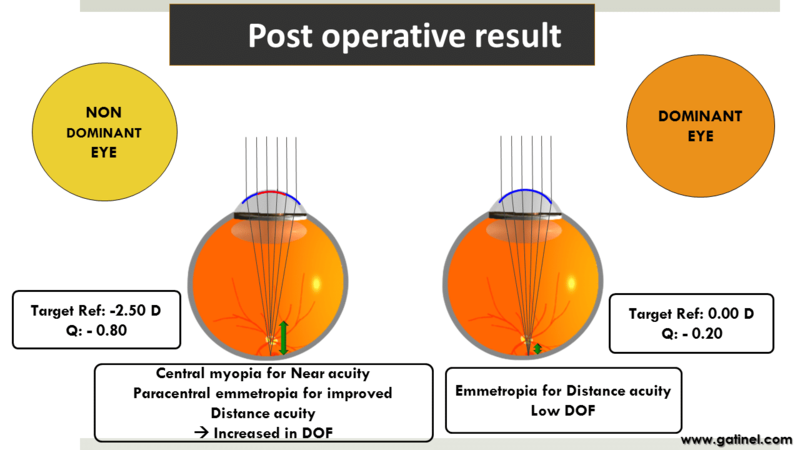 In the context of presbyopia compensation with excimer laser surgery, some level of useful multifocality can be achieved by inducing myopic defocus within the paraxial zone and altering the ablation profile to reduce its amount within the paracentral zone. In such a situation, the eye would be best refracted for distance with a negative spectacle correction, and hence can be considered as myopic. However, its uncorrected distance acuity would exceed that of an eye where the whole pupil area (paraxial and paracentral zone) would both be equivalently myopic. Nuclear cataract can result in a myopic shift, the effect of which is predominant within the paraxial pupil zone. 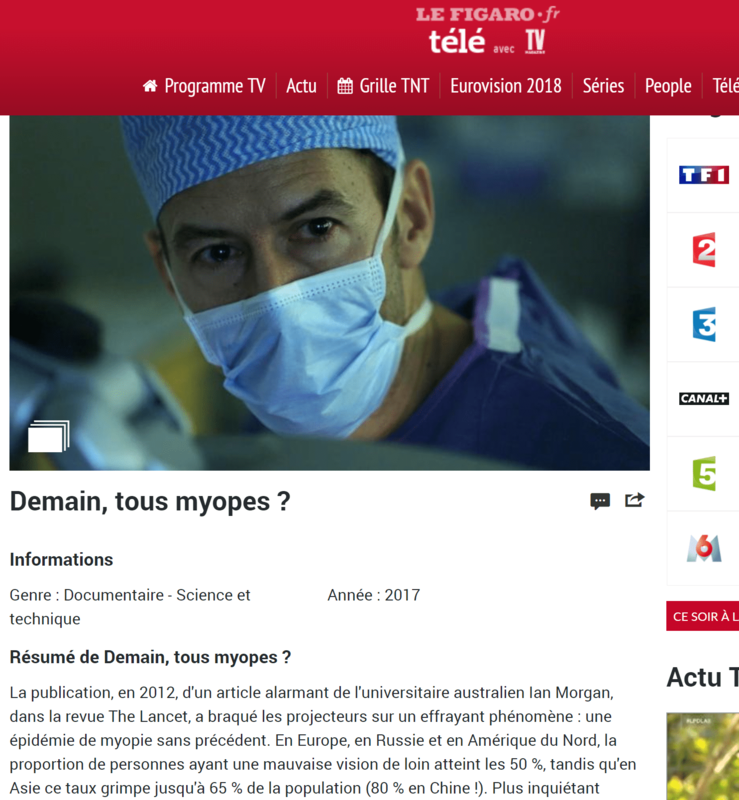 This myopic shift results from the increase of the refractive indices of the crystalline lens nucleus proteins, and is often referred as to “index myopia”. In such situations, an increase in negative spherical aberration is commonly observed, and the myopic shift within the paraxial pupil zone induces an improvement in the uncorrected near visual acuity. However, in contrast with a situation where the whole pupil would be affected by a myopic error, the less myopic (or closer to emmetropia) paracentral pupil zone provides the eye with improved uncorrected distance visual acuity (Figure 4). Figure 4 : This left eye OPD map was obtained in 2016 of a 55 year old patient referred for early nuclear cataract in the left eye (his 2013 OPD examination was used in the figure 1). The central increase in the index of refraction of the central part of the crystalline lens resulted in a myopic shift : best corrected visual acuity was 20/20 with a -2.50 D correction. The patient can read now Jaeger 2 without any optical aid with the left eye, whereas the right eye (without a cataract) needs an addition of +2D to read J2. 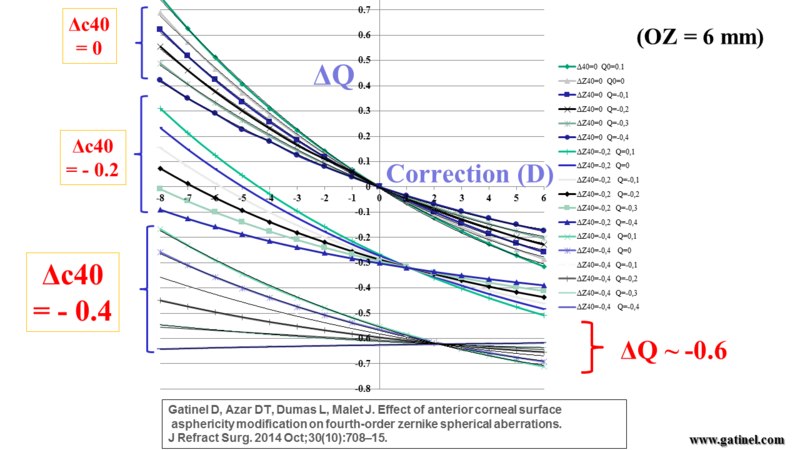 The ocular spherical aberration coefficient measured in 2016 was negative (c40 = -0.283 microns for a 6 mm zone). In 2013, this same coefficient value was c40 = +0.113 for a 6 mm zone. Because there is a relative reduction of the myopic error toward the pupil edges, uncorrected distance visual acuity is 20/30 with the left eye! The paraxial pupil myopic shift incurred by the nuclear sclerosis has provided some « useful multifocality ». How does multifocality differ from monovision? In classic monovision, the dominant eye is corrected to achieve satisfactory uncorrected distance visual acuity, whereas the non-dominant eye is made myopic to see well at near without any optical aid. In such situations, the non-dominant eye becomes “fully” myopic in the sense that the planned correction results in the same myopic refractive error within the pupil area. This consistent negative defocus reduces significantly the uncorrected distance visual acuity and compromises binocular stereopsis. When a multifocal correction is planned, although the refraction of the non-dominant eye would still be measured myopic (dominated by the paraxial defocus), there is a relative imbalance between the induced myopic error within the paraxial pupil zone and the “low myopic to emmetropic” paracentral zone. This reduction of the myopic refractive error toward the pupil edge aims at providing the eye with better uncorrected distance visual acuity. This gradient of defocus from the center to the edge of the pupil is reflected in the induction of negative spherical aberration. 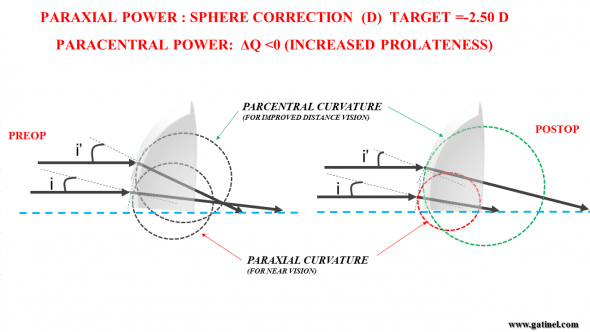 Why is spherical aberration useful for presbyopic multifocal correction? Spherical aberration corresponds to a variation of the ocular power and can be manipulated to increase the ocular depth of field. However, some requirements must be fulfilled to make spherical aberration a “useful aberration” in the context of presbyopia compensation. There is an obvious benefit to inducing a myopic defocus error at the pupil centre to make the fovea conjugate with targets located at a reading distance. In such situations, the paraxial pupil zone corresponds to the near zone, whilst the refractive power within the paracentral zone (mid and extreme periphery of the pupil) can be reduced towards emmetropia. Placing the “near or reading zone” (inducing a myopic refraction) at the central area of the pupil enables one to take advantage of the near constriction effect of the pupil, which occurs when the eye attempts to accommodate and gazes at a near target. The reduced vergence (progressive reduction of the myopic error) at the paracentral zone allows one to achieve a better uncorrected distance visual acuity than if the whole pupil area was myopic. 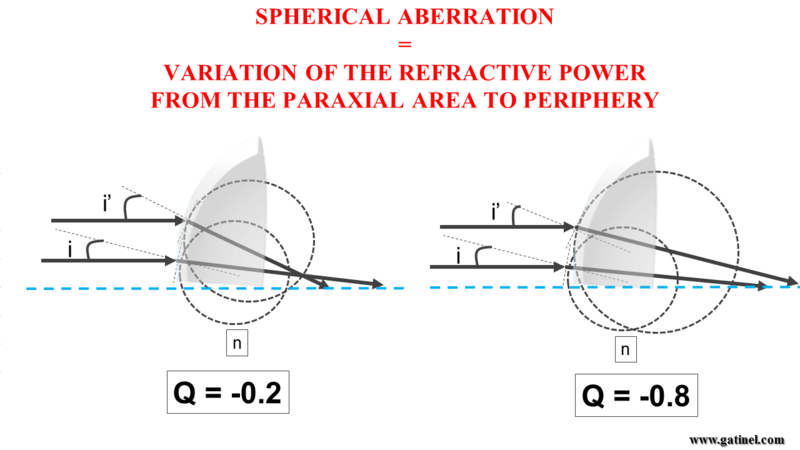 In aberrometric language, this relative increase of refractive power at the center of the pupil with respect to its periphery (or the relative decrease of refractive power at the pupil periphery) translates into an increase in negative spherical aberration (see Figure 4). It is important to keep in mind that, in this context, negative spherical aberration must be accompanied by selective central pupil myopia to provide the operated eye with efficient multifocality. To better understand this constraint, consider a presbyopic eye where the central pupil portion would be emmetropic, and for which consistent amounts of negative spherical aberration would be found using aberrometry measurement. This eye would only be able to attain satisfactory uncorrected distance visual acuity and may suffer from night halos due to the relative hyperopia present within the peripheral pupil area. Satisfactory uncorrected near vision would not be possible due to the accommodation power being insufficient in a presbyopic eye, as no rays emitted by a near source would be focused at the retinal plane. How is it possible to modify the ocular spherical aberration with laser corneal ablation? 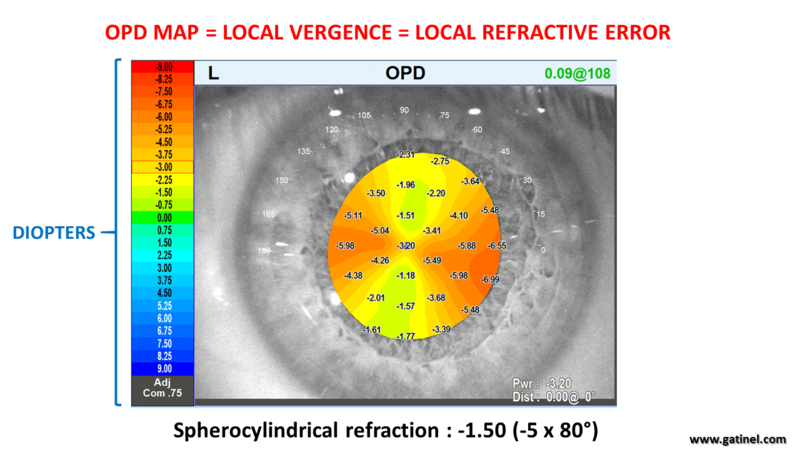 Ocular spherical aberration results from the balance between anterior corneal spherical aberration, and internal (posterior corneal surface and crystalline lens) spherical aberration. Ocular spherical aberration is usually mildly positive and governed by the anterior corneal spherical aberration. Anterior corneal spherical aberration depends on the difference between the central and peripheral corneal curvature. A curved surface whose power gradually decreases or increases from its center to its periphery is said to be aspheric. The corneal profile of the human eye has negative asphericity; its curvature decreases from the apex toward the periphery. A mathematical variable, named “Q”, can quantify the level of asphericity of the corneal contour modeled as an ellipse (Figure 5). A negative Q-value characterizes a prolate asphericity (the curvature decreases toward the periphery), whereas a positive Q-value characterizes an oblate asphericity (the curvature increases toward the periphery). Figure 5 : The asphericity of the cornea can be calculated by approximating the corneal profile of interest by a best-fit ellipse. The Q value is computed from the ratio of the respective lengths of the major axes of the ellipse. On the left: some theoretical profiles having the same paraxial curvature but different asphericities are shown. The local refractive power of the cornea depends on its local radius of curvature. For the same ray incidence, the lesser the curvature, the lesser the local refractive power. In most normal eyes, the reduction of the corneal curvature toward the periphery is not sufficiently pronounced to reduce the effect of the increase in the angle of incidence of peripheral rays with the corneal surface. Despite local curvature reduction toward the periphery (prolate profile, lesser keratometry towards the corneal periphery), the corneal power at the periphery of the cornea is still more pronounced than at its center; this explains why the physiological spherical aberration of the cornea is slightly positive (Figure 6ab). To cancel spherical aberration, the corneal asphericity should be, on average, more negative than what is found in most human corneas. Such a surface, derived from spherical aberration, is referred to as a Cartesian oval. To reverse the corneal positive spherical aberration to a negative value, the corneal asphericity must take a more negative value. Hence, to create a multifocal corneal profile, the laser correction must increase the negative asphericity of the cornea. Figure 6 : In this example, the paraxial powers of both corneas are identical and have the same refractive index (n), but the profiles have different asphericities. Spherical aberration depends on the value of the change in asphericity of the corneal profile. On the left, the cornea is slightly prolate (Q =-0.2) and flattens toward the periphery. This flattening is not sufficient to cancel spherical aberration, which remains slightly positive. On the right, the cornea is highly prolate (Q=-0.8). The important flattening reduces sufficiently the angle of incidence of peripheral rays to revert the sign of spherical aberration, which becomes negative. 2) to reduce the refractive power value toward the pupil periphery, with a concentric outer near-emmetropic zone aimed at improving uncorrected distance vision. The reduction of the refractive power toward the pupil periphery can be achieved by increasing the value of the negative corneal asphericity (increasing prolateness). In such an eye, some amount of negative spherical aberration is expected. Figure 6 b : The combined correction of presbyopia and hyperopia can be schematically depicted as the change of paraxial curvature to a value (shorter radius) which induces a postoperative myopic refraction (ex: -2.50 D). Paracentral curvature can be adjusted by selecting a specific target asphericity. This asphericity change aims to reduce the paracentral curvature, so that the refractive power of the paracentral zone is close to emmetropia. What is the optimal value of the negative spherical aberration to provide the outer pupil near- emmetropic power zone? 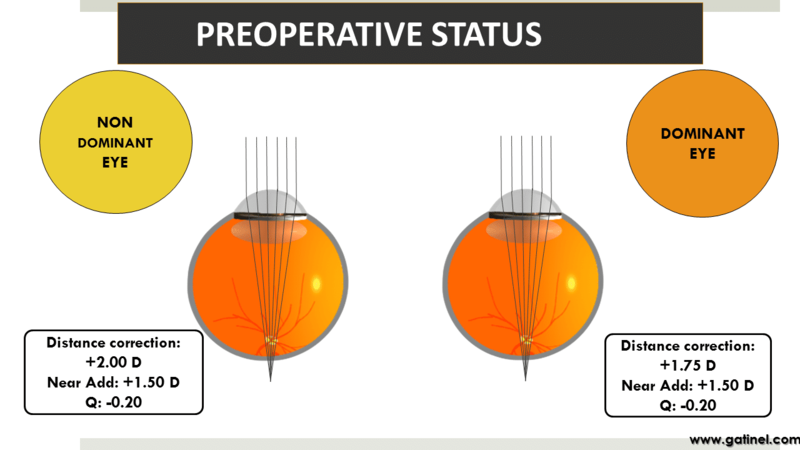 Several clinical observations, which include presbyopic patients rendered spectacle independent after hyperopic LASIK surgery, or presenting with nuclear cataract (see Figure 4), point towards a value of negative spherical aberration which can be rounded to c40 = -0.3 microns for a 6 mm pupil. As the value of the ocular spherical aberration is usually close to c40 = +0.1 microns for a 6 mm pupil, the beneficial change in spherical aberration (Δ c40) should be equal to Δ c40 =-0.4 microns for a 6 mm pupil. This change must be achieved via the alteration of the corneal contour and some increase in negative asphericity (ΔQ). What value for the change in corneal asphericity (ΔQ) can induce a variation in spherical aberration of Δc40= -0.4 microns on a 6 mm optical zone? This question can be addressed through theoretical modelling which was addressed in 2014 in a publication in the Journal of Refractive Surgery (2). 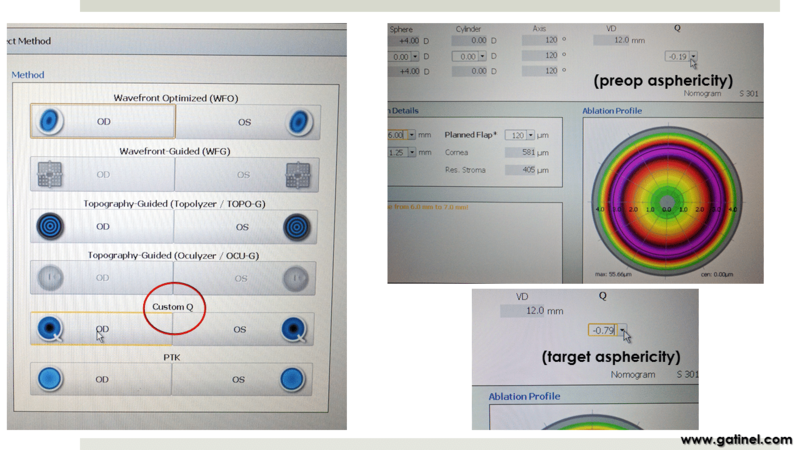 The theoretical pre- and postoperative corneal profiles were modeled as ellipses, each having a specific apical radius of curvature (R1, R2) and asphericity (Q1, Q2, with ΔQ = Q2-Q1). 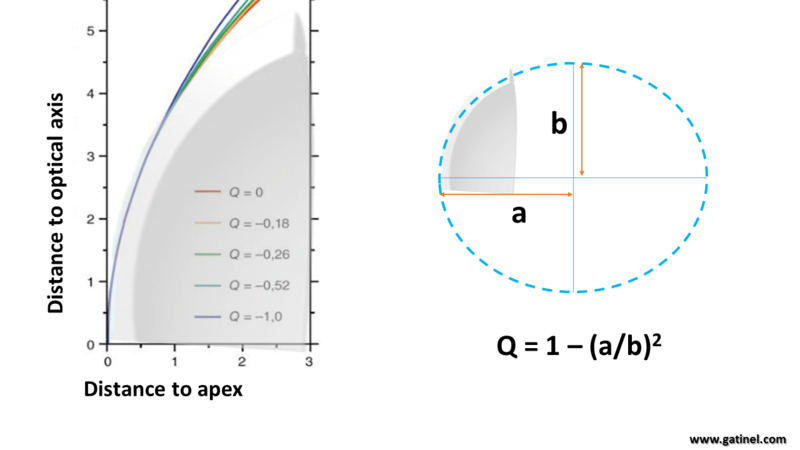 The change in refraction (D) was directly influenced by the change in apical curvature (R1 à R2) while the modification in the corneal asphericity (Q1 à Q2) governs the change in spherical aberration (Δc40). The spherical aberration is also partly affected by the change in the apical curvature of the cornea; increasing the corneal curvature (i.e steepening the cornea) without changing the asphericity of the corneal profile would result in an increase in the positive spherical aberration. However, as shown in the following graph, the theoretical influence of the refractive correction does not have much effect on the change in corneal asphericity (ΔQ) necessary to induce the shift towards negative spherical aberration. To achieve a change of Δc40= -0.4 microns on a 6 mm optical zone, an increase in prolateness of ΔQ = 0.6 in the corneal asphericity should be targeted, regardless of the positive spherical correction programmed in the laser, and of the value of the initial corneal asphericity (Q1) (Figure 7). Figure 7 : To induce a reduction of spherical aberration of Δc40= – 0.4, the change theoretically required in corneal asphericity is close to Q ~ -0.6. This change is not significantly affected by the amount of positive sphere correction (D). The X axis represents the amount of sphere correction (from myopic corrections to hyperopic corrections). The Y axis corresponds to the value of the theoretical change in asphericity. The higher the intended change in spherical aberration, the large the required change in corneal asphericity, which must always be planned toward increased prolateness in the case of positive (hyperopic) correction. 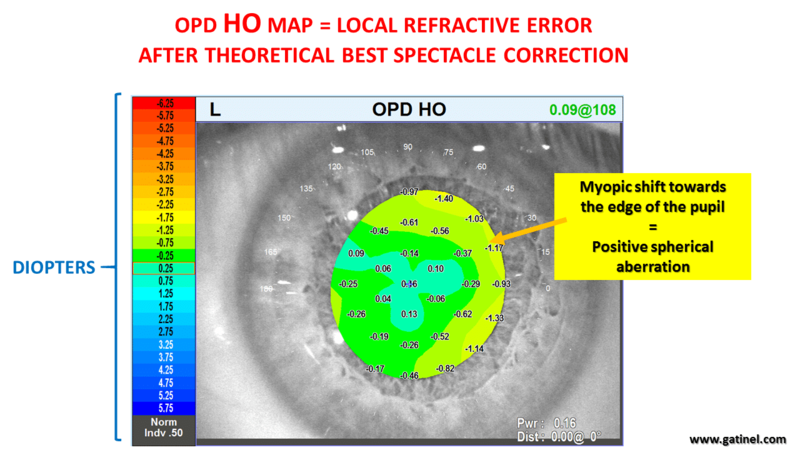 Figure 8a : Example of preoperative refractive errors and Q-values for a presbyopic hyperopic patient. Figure 8b : The nomogram for the non-dominant eye is derived from the principles explained on this page for the non-dominant eye. The induction of very prolate cornea results in a rapid reduction of the amount of induced negative defocus. The latter provides the non-dominant eye with improved uncorrected near vision, while the peripheral demyopisation reflected in the amount of negative spherical aberration reduces the number of lost lines for distance vision. 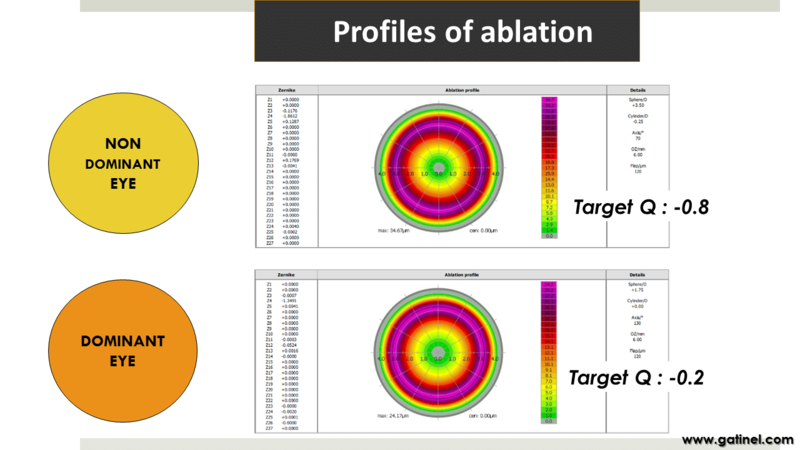 Figure 8d : Representation of the ablation profiles for the dominant vs non-dominant eye. Targeting a more prolate cornea causes the reduction of the peripheral depth of ablation. The figure 9 shows some screenshots obtained while programming the hyperopic-presbyopic correction using the described nomogram. The refractive results will be improved by centering the laser correction on or close to the corneal vertex, using technologies like iris recognition. and cyclotorsion compensation. In this context, the integration of pupillometry information, along with the profile of ablation and LASIK flap design within the same program software unit (Wavenet TM) represents a useful feature. In our practice, all the operated patients benefit from preoperative pupillometry and iris mapping in order to center the photoablation at 75% of the distance between the pupil center and the corneal apex. The minimal diameter of the flap cut performed with the FS200 femtosecond laser was 9.5 mm. The change in asphericity, which is the mechanism by which negative spherical aberration can be increased, results in a progressive reduction of the induced myopia from the paraxial zone to the paracentral zone. Typically, uncorrected visual acuity of J2 and 20/30 can be obtained after the wound healing phase, and provides the patient with spectacle independence for distance and near vision. The clinical results of this multifocal strategy have been reported recently in the Journal of Refractive Surgery (1) (Figure 10). Figure 10 : Results extracted from a recent publication in the Journal of Refractive Surgery (1) reporting on the clinical results obtained when applying the presented nomogram for the LASIK correction of presbyopic hyperopic candidates. The attained binocular uncorrected visual acuity at near and far distances seem sufficient to provide operated patients with full spectacle independence for most of their daily and professional tasks. The understanding of the interplay of key variables that serve as a basis of multifocal corneal laser photoablation allows the design of a non-empirical approach for the combined treatment of hyperopia and presbyopia. This strategy is based on a theoretical approach, which translates into consistent and encouraging clinical results. 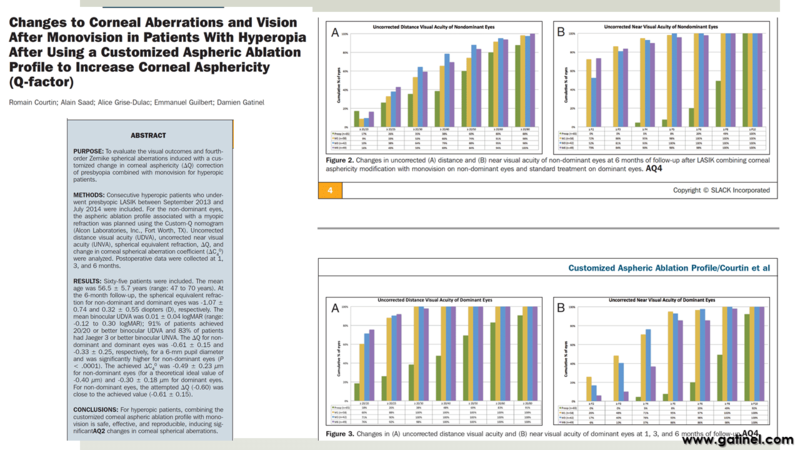 1) Courtin R, Saad A, Grise-Dulac A, Guilbert E, Gatinel D. Changes to Corneal Aberrations and Vision After Monovision in Patients With Hyperopia After Using a Customized Aspheric Ablation Profile to Increase Corneal Asphericity (Q-factor). J Refract Surg. 2016, 1;32(11):734-741. 2) Gatinel D, Azar DT, Dumas L, Malet J. Effect of anterior corneal surface asphericity modification on fourth-order zernike spherical aberrations. J Refract Surg. 2014;30(10):708–15.